The crucial steps I take moments before surgery begins. As surgeons, we’re taught to think like this from day one of medical school. In order to stay focused on the tasks at hand and do our jobs quickly and effectively, we’re told, we need to disengage and think about the disease or problem we are treating—not the person lying on the operating table. For most of my neurosurgical career, I took these edicts to heart. But all that changed about three years ago, when I almost lost a patient on the table. I was operating on a 40-year-old woman with a cerebral aneurysm, a small balloon or blister that grows from a larger vessel of the brain. Appropriately nervous about brain surgery, she had delayed the surgery for a few months until she was ready. But I had reassured her that she was a relatively low-risk case, with a less than 1 percent chance of death. When I spoke to my patient just before her surgery, we discussed when she would go home and how presumably straightforward the procedure was. We talked about the “creative” haircut we’d be giving her, and she smiled and laughed, happy to finally be putting the surgery behind her. All was going according to plan until about halfway through the procedure, when my patient’s artery began to bleed. It wasn’t significant at first, but the bleeding quickly worsened. I knew I had a major problem on my hands—if I didn’t stop the bleeding, the woman would die on the table. As I struggled to get control of this horrible complication, fear began to creep in. Never before had I been as terrified; it hit anew the incredible responsibility that we have as we take people’s lives in our hands. Now my sense of detachment was completely gone. I began to think of the patient as a wife, mother and friend. If this patient died, what would I tell her husband? What would I say to her young children? My heart raced as I thought about my own wife and my kids and how they would feel if I were to die suddenly. Then something remarkable happened. The bleeding stopped, and my patient’s vital signs stabilized. The anesthesiologist gave her a blood transfusion and I was able to finish the surgery with no other issues. My experience in the operating room (OR) that day forever changed the way I approach every surgical procedure that I do. I no longer try to stay as detached as possible from the person who is lying on the operating table. In fact, I do just the opposite. I now take extra steps prior to beginning surgery so that everyone in the OR is reminded that the patient we are about to operate on is a human being. Someone with a family and a career. Someone with hopes and dreams for the future. First, I spend a couple of extra minutes to tell my colleagues in the OR about the patient. I’ll start by reviewing the specifics of their case and what we’ll be doing, and then I’ll take a moment to mention some particulars about the human being before us: where they live and what they do for a living; whether they’re married or single; the ages of any children. I talk about their hobbies and passions, as well as their plans after recovery. Taking these minutes to fill everyone in on these kinds of personal details may seem insignificant, but my close call in the OR a few years ago has convinced me that it’s absolutely not. What I learned that day is that completely detaching ourselves from thinking about the patient as a person not only isn’t necessary, it may not be good for the patient. When everyone in the room knows more about the human being behind the patient, they become more focused on the task at hand and more emotionally invested, which is always a good thing. The last extra step I take before the surgery begins literally takes 10 seconds. It’s an idea that my colleague Dr. John Boockvar brought to Lenox Hill when he joined the department of neurosurgery in 2014. First, I ask that everyone in the room stop talking and be completely quiet. The music gets turned off and the only sound you can hear is from the anesthesia machine. Then I ask everyone to close their eyes and take slow, deep breaths while they silently count to 10 in their heads. It’s a zen moment that to me feels very comforting. Really, it makes so much sense. 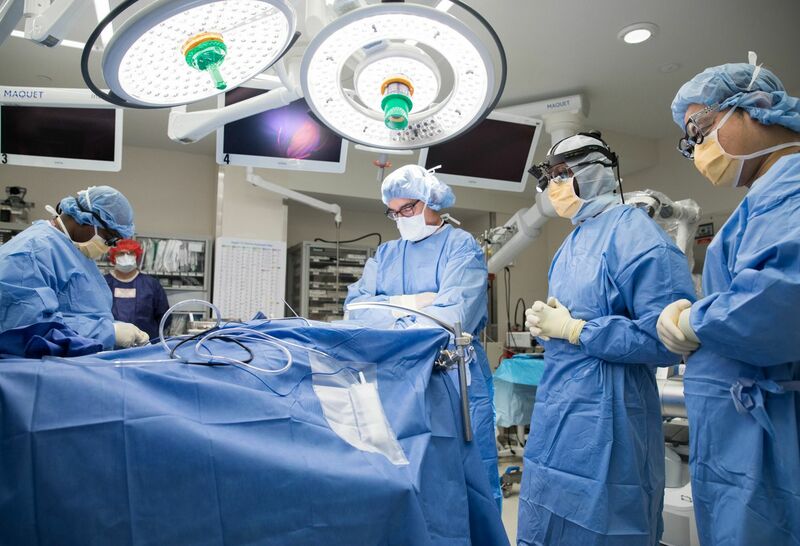 With everyone running around getting ready for surgery, the OR can often feel very noisy and chaotic. But this last mindful moment where everyone is completely quiet really calms everyone down and helps us all focus on the important work we’re about to do. In the past two years, I’ve included these mindful moments before surgery on approximately 700 patients, and I can see the meaningful impact that they’ve made. These small but significant gestures are reflective of the respect our team members in the OR have for each other. But even more importantly, they reflect our empathy and compassion for the person who is entrusting us with their life. Find out more about Dr. David Langer and the team of experts who make up the Department of Neurosurgery at Lenox Hill Hospital, located in New York City.